'Toys', the word synonymous with joy and laughter has always been childhood's best friend. With an objective to create a delightful mocktail of these two worlds, Toybankers from GENPACT and FMS, Delhi, set out to provide toys to children of an NGO called 'Project Swati' in Kanak Durga Colony at R.K. Puram. New Delhi. The solace of a toy is heart rending, more so, for children who are devoid of life's such simple pleasures. The mission was simple, the vision, noble and end goal, achievable. Having had a head start on time, being 15 minutes ahead of schedule, gave us enough time to take stock of all the toys that had been brought and segregate them by age groups. 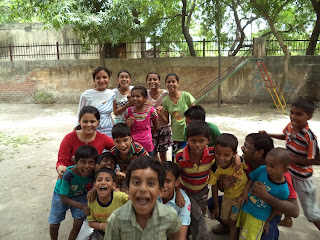 The venue was teeming with cheerful and anxious faces of children between age groups of 3 thru 12. Our first task was to create clusters (by age group) of a max. of 5 kids lead by one volunteer each. That being accomplished, we rolled up our sleeves and sprung into action. The rules were simple, it had to be a new game that the children hadn't played before and we had to teach them how. Sharp and intelligent as they were, the children were quick to learn and soon were deeply immersed in playing those games that they had learnt just a while ago from their volunteer friends, whom they fondly addressed as 'Didi' and 'Bhaiya'. Soon the venue pulsated with their enthusiastic babble and joules of energy! 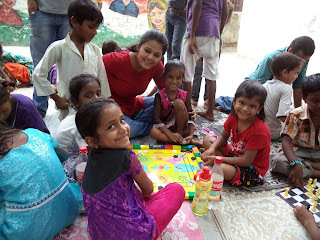 We hadn't the slightest whiff as to how the hours sped by and before we knew it, the team of 12 volunteers had played a gamut of games like 'Speller', 'Building Blocks', 'Jigsaw puzzles', 'Chess', 'Ludo', 'Clay Modelling' etc. 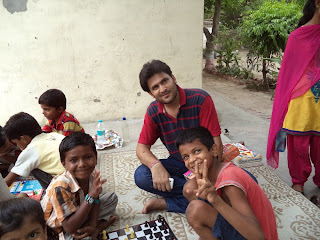 with the group of 40 children. The children were not devoid of a sense of humour and would laugh out loudly at any mistake that their volunteer friends made (intentional or not...:-)).